Gay Ski Week in Queenstown NZ is the largest gay winter alpine party in the Southern Hemesphere which is 8 days packed with exclusive parties and social events not too mention of course skiing, snowboarding. The week has been running since 2003 and has grown to see thousands of visitors descend on Queenstown for this amazing week which is supported by locals, business and other visitors. 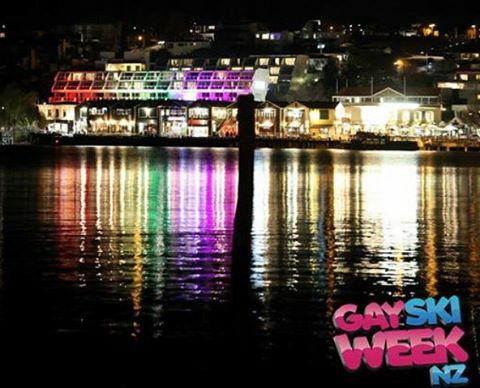 GAYSKIWEEKNZ.COM have a range of travel and accommodation options available with over 50 hotels, apartments and resorts along with an exclusive tour package, WhiteOut NZ Tour 2016 which includes 8 days/7 nights at the official Host Hotel Crowne Plaza Queenstown. Packages are all inclusive with accommodation including breakfast, an All-access events Pass and daily skiing and other activities. If you're not a fan of the cold, you'll stay warm at an array of bars, cafes and restaurants all a short walk from your hotel. Relax by the fire with a glass of wine then dance the night away at our exclusive GSWNZ events and you'll warm up pretty fast. If you've never been skiing, then you're in for some fun. We provide full lessons with your ski packages from our friends at SnowBiz QT. Take the GSWNZ Pink Bus up to the mountains daily with the crew and our ski guide Grant. If you're not up for skiing, don't worry. We have a daily itinerary for those who want to get out and enjoy all the amazing things Queenstown has on offer. Join our guides or venture our on your own or with your mates and try jetboating, a lake cruise, wine tour or chopper flight over the alps. You won't run out of things to keep you moving. You're free Gay Ski Week MyQT gives you up to 50% off a range of tours, attractions, restaurants and cafes in town. See our Things to Do page on our website.